Stone has been carved since ancient times, and the tools used to carve have changed very little over the centuries. The ancient Egyptian sculptor would recognize the basic carving tools in my studio today, specifically the mallets and the chisels. There would be minor differences in that my chisels are made of steel where the Egyptian sculptor of four millennia ago would have known chisels of copper or bronze. The wooden carver's Mallet is also virtually the same today as it was four thousand years ago. The tool has a rounded head at the end of a handle. The curved head allows the carver to strike the head of the chisel without having to keep the Mallet in any kind of orientation in the hand. The size of the mallet head varies depending on the needs of the user and the type of soft stone being worked. The tool will eventually wear out (the example at upper right is near the end of its useful life) as each blow of the chisel also takes its toll on the striking tool as well as the workpiece. other. Similar tools today look very much the same. The ideal shape of the round carver's mallet is echoed in the metal head of the Dummy. The metal head imparts a greater force to the blow than the mallet provides, which might be desired when working a somewhat harder stone or when seeking a slightly sharper blow - as in lettercutting. A tool that is commonly available now is the high density polyethylene or nylon carver's Mallet. Like the Maul, these tools have the double advantages of being almost indestructible during normal usage but retain the easy-on-the-arm working qualities of a traditional wood Mallet, and are quieter to work with. A tool intermediate between the striking qualities of the wood Mallet and the metal Dummy that is not often found today is the Leather Maul. It has a core of metal but both the handle and the striking head are made up of layers of leather discs. The leather is very durable and allows a relatively 'dead' blow that doesn't bounce and is easy-on-the-arm of the user. Though Mallets and Dummys can be used to strike any type of carving Chisel, there are chisels specifically made for use with the softer materials these striking tools are typically made from. 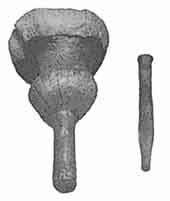 Mallet Headed Chisels have a mushroom-shaped striking end that spreads the blow over a greater surface area on the mallet head and thus minimizing the damage to the Mallet. Because the Mallet Headed Chisel is intended for use only on soft stone, the entire shank of the steel tool is hardened and tempered. This makes the Mallet Headed Chisel unsuitable for being stuck by a hardened steel hammer which could cause the metal or the chisel to fracture or chip off. 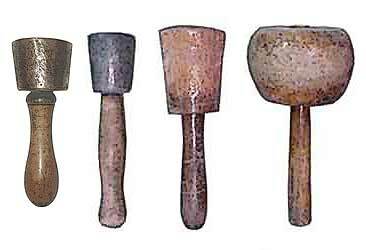 Note: A mushroom-shaped head of a Mallet Head Chisel is different than the 'mushrooming' of a chisel head. 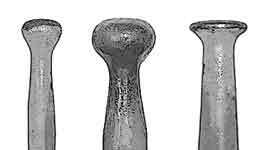 Mushrooming is when the head of the chisel has been struck and beaten so that the edge of the head has rolled out and flattened, as on the first detail of the chisel head on the far left. This condition should not occur on a Mallet Head Chisel because it should not be struck by a hard steel Hammer. Hammer Headed Chisels will mushroom, however, and if the condition is allowed to continue unchecked the mushrooming will lead to the fracturing or chipping off of the head, as on the detail of the second example at left. Grinding the mushroomed edges off the head every time the chisel is re-sharpened will prevent future damage. Wooden handles and Mallet Head chisels are ideal for carving softer stones, but these tools struck with a mallet have minimal effect when carving harder stones. For carving marble and stones of similar resistance a steel hammer is best used, which requires a slightly different design of chisel . . . In France, where there is a tradition of building with and carving very soft limestones such as Caen stone, many of the tools used seem to be a throwback to Medieval times. On a previous page there were two examples of large-toothed hand saws that look more like they are for cutting wood rather than stone, and here also the wood-handled chisels look primitive or quaint when compared to the tools more commonly seen in catalogs from modern tool supplier's. 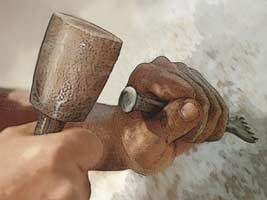 But though these images were made from antique examples in a museum, the modern stoneworking supplier Joseph et Fils in Paris sells brand new examples of these same tools today. Chisels and saws are not the only types of tools which are specific to working the soft Gallic stones, on a later page we shall examine some unusual-looking Rasps. old but new . . .